We painted the room "Refreshing Pool" by Behr. I can't be more happy with the color. I then caved and bought my daughter the Brooke Bedroom by Pottery Barn Kids. I have been eyeing it for over a year now. I still need to outfit the top bunk with the same bedding. I only bought one set to make sure I liked it in the room and I do. 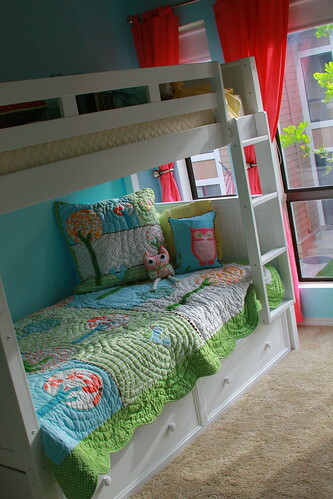 I want the beds to match since I am a matchy matchy person, plus when the girls are old enough they might want to make the bunks beds into twin beds (since they can be pulled apart) and I would want the bedding to be the same. I made my daughter the little owl softie sitting on the bed today. I wish it was bigger, but that is what happens when you are making something without a pattern and just going with the flow. I took this pic with my iphone to send to my friend a quick pic once I was done. I forgot to take one with my camera :( I embroidered on the nose since every attempt I made at sewing one on with fabric was a disaster! Now I just need to get going on the quilt for the baby and wait for my Mom to make the bumper pads. So stay tuned! It's fabulous! There is the most wonderful owl quilt in the current issue of Australian Simply Patchwork & Stitching. And in those colours too. Perhaps it was the inspiration? That wall color is gorgeous, too-- do you remember the name of the paint? I love the colors! Nice and cheery :) You did a beautiful job with the owl! Your owl is adorable! That bedding is great too. I've been thinking about the same bedding for my own daughter. I think I need to think a bit harder. It's very cute! Oh Darci! I love the room, and of course, I love that bedding, and the little softie you made. :) Are those the final curtains yet? I've been following your blog (and enjoy it much) for a few months now :). 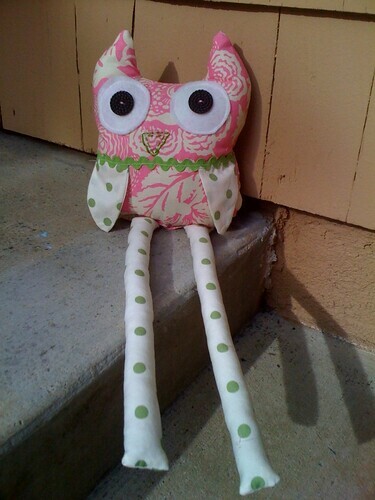 I couldn't help but comment on this post to show you that I made a very similar owl for one of my dear friend's daughter's room with the same bedding :). We also painted 3 big trees on her walls (which are a paler blue) in the same style as the bedding. Totally fun and quirky! I LOVE the wall color ... this would be a dream room for me if I was a little girl :). i LOVE your little owl...how cute! I want to make one NOW! The softy is too cute! WOW! Beautiful wall color, matches perfect! oh, that paint color is beautiful! I love your little softie, and the nose is sooo cute! I love the owls! So cute! Great colors in the room too! How funny! I am having a girl in Nov. and looked at this bedding at least once a day. I was going to break down and buy it but saw an adorable quilt in my local shop that is too cute so I guess I am making a twin and crib set now! PB is always great inspiration though! OMG i'm in love! 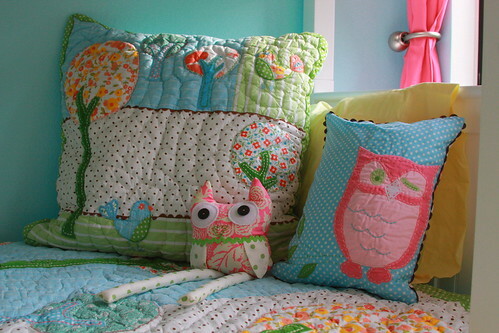 LOVE LOVE that bedding and that owl! I churn out quilts at a pretty good clip, but even I would have bought that one. It reminds me of the new Wildwood trees from Erin McMorris. Your owl is great, I know what you mean, my stuffed toys always turn out smaller than i'd like since I don't use a pattern either. 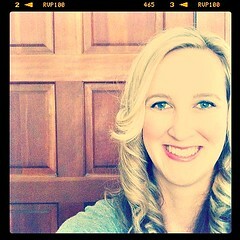 Check out the monster I blogged today. that is beautiful.......you did great.